Our next Lunagirl Moonbeams Blog Challenge theme is one of my favorite things: Bellydance. 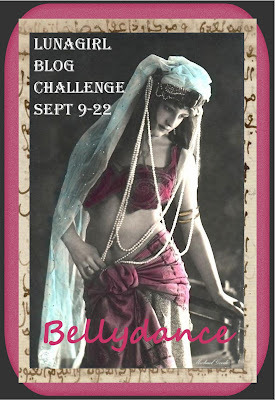 You've maybe seen some of the gorgeous vintage bellydancer Paris postcards ~ they are some of my very favorite vintage imagery. I have a very nice collection of vintage bellydance and gypsy girl images available, many of them altered or embellished by me over the years. 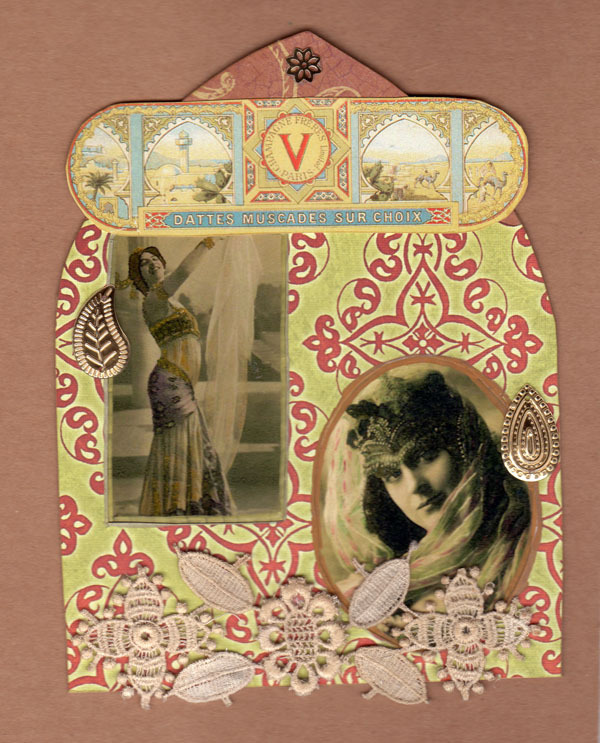 I've made some into my Bellydancer collage sheets, and many are available on my Lunagirl Ladies Photos CDs (you'll find classical & exotic ladies on Volume One, bellydancers & middle eastern costume on Volume Three, and gypsy girls on Volume Four). This challenge (#10) will end at 11:55 pm on September 22 ~ The winner will be selected randomly (random number generator) to win two free Lunagirl digital collage sheets of your choice! Please link back to my blog & Lunagirl.com on your site if you have one. And do not miss the beautiful and inspiring creations of the Design Team, following below! my belly dance piece is a gothic arch using 2 images from "la danse orientale" and various papers and charms to evoke the romantic feel of the beautiful art of belly dance. Here is gorgeous tag from our newest Lunagirl Moonbeams Design Team member, Mandy Chilvers. Love the deep jewel colors! This card is serving two purposes. Firstly it is for the Lunagirl challenge. Secondly it is the inspirational piece for my challenge which uses a picture as a basis for the card. I love it when a card serves more than one purpose. For this card I used my Gelli plate and made the background. 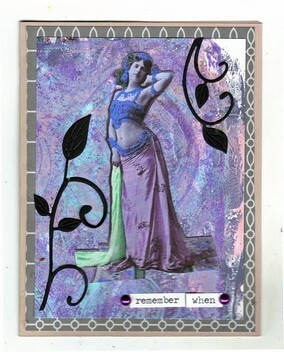 Next I used a Lunagirl image, cut her out and placed her the background cardstock. A sentiment and some altered flourish were added. this sounds like an awesome challenge. love the bellydancer theme!! Hi ~ I hope you'll join us! Sounds like fun! How do I enter my project :) ? Hi ~ In the post look for a little blue button that says "Add Your Link." It is above the Design Team images but just below the pictures that have already been entered. Just click that blue button and follow the directions to Link Up your project!